When I first started my "Must Dos" series, I put the parks in a random order. Looking back, I realize this is the order in which I'm missing the parks the most right now! Epcot and Magic Kingdom are often interchangeable as my favorite parks, and no trip would be complete without visiting both! Without further ado, here are the Top 5 Must Dos for Epcot! The Land Pavilion houses Soarin' and Living with the Land. Over in the World Showcase, though, there are only 2 rides and a lot of movies and shows to take in. As a general rule, you only have to wait for the show or movie before yours to get out to get into one yourself. In regards to rides, though, the Maelstrom in Norway does get a fairly long line. A Fast Pass can be a good idea when they have them available. I find that queue to induce claustrophobia in me, so look out! The attraction most miss and don't realize is there is in Mexico: The Gran Fiesta Tour Starring the Three Caballeros. The line is typically nonexistent because the ride is completely inside, past the gift shops, beside the restaurant, and often hidden by the Mariachi band! The song will be stuck in your head all day, but it's a nice quiet, air conditioned, boat ride that you won't soon forget! Touring in peak seasons, which I often do since I'm a teacher, means I have to know what attractions are best for Fast Passes and which queues are shorter for between Fast Pass times. If you're going during a peak season, I recommend reading my Thanksgiving Trip Report (scroll to the bottom of the page to find it by day). 2. 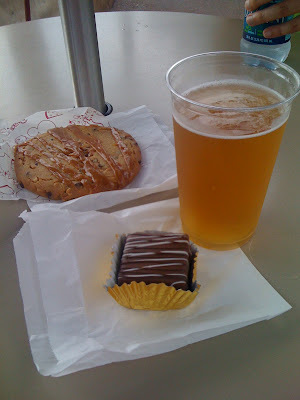 Kidcot and Agent P's World Showcase Adventure: Epcot is typically a favorite park for adults, but having kids in tow, especially young ones, can make it not as enjoyable for the whole party. It feels like there's more walking here than anywhere else, and while you might enjoy exploring the various countries, your toddler might not be as keen on this more educational park. Knowing your kid friendly spots in the World Showcase can give the adults time to look around and take in the beauty of the countries. Agent P's World Showcase Adventure is great for older kiddos. This is the old Kim Possible Adventure remade. You pick up a "transponder" cell phone like device called a F.O.N.E. (Field Operative Notification Equipment) that guides you through the World Showcase to stop the evil Dr. Doofenshmirtz. Your F.O.N.E will cause different elements in the World Showcase to move and reveal mission related items. Missions vary, so if you and your kiddos enjoy this, do it more than once as you tour! One tip: don't get so caught up in your mission that you fly through the countries and forget to look around! African Outpost to find seats and tables shaded by umbrellas. The area offers a peaceful view of the World Showcase while you eat. 4. IllumiNations: Not sure if you can tell, but World Showcase is really my favorite side of Epcot. A great way to end your night is with the fireworks show off of the World Showcase Lagoon. It's a tribute to all of the nations full of lights, fireworks, and moving music. While Wishes is by far my favorite, IllumiNations should not be missed! Want a good spot? I've always had luck standing in Mexico, right next to the Ring Carver's booth, across from the margarita stand. Taken while riding the Monorail. Want a good view of Epcot? Make sure to ride the Monorail that circles the Park! 5. Spaceship Earth: I saved my favorite for the end. Did you know that some people go to Epcot and never realize that there is a ride inside of Spaceship Earth?! 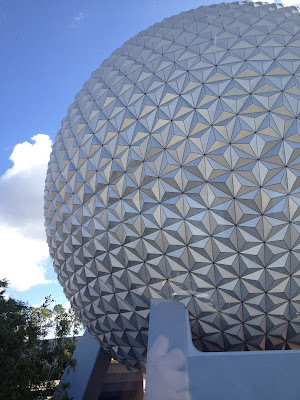 Even more shocking is that some don't realize that the "Big Ball", "Epcot Ball", or "Giant Gold Ball" is actually called Spaceship Earth. *Sigh* This is by far my favorite attraction at Epcot, quite possibly my favorite attraction in ALL of Walt Disney World. The line moves quickly even when it looks long because the ride is on a continuously moving track. Inside you will be taken on a journey through the history of communication. I know, I know, that makes it sound like a snoozefest, but trust me, you'll be glad you went on it. At the end of your journey, there's an interactive bit on the computer that helps you shape your future, and after you get off of the ride there's a fun "play area" on the way out that adults and kids will love. Be sure to take the time to play. I always get rushed out, and I always want to play! Plan at least one day, maybe more for Epcot. This is a great park to catch tons of characters. Be sure to grab the Times Guide as you go into the park to know what characters will show up when and where. This will stop you from spending your day running back and forth between Future World and World Showcase. Lines do get long though, so be prepared to go wait long before the character is set to show up to make sure you get to meet them. Come back on Friday to move to our next stop in the series: Disney's Hollywood Studios!